Mt. Carmel players model the jerseys they will wear and then auction off as part of Saturday’s fundraiser for cancer research. 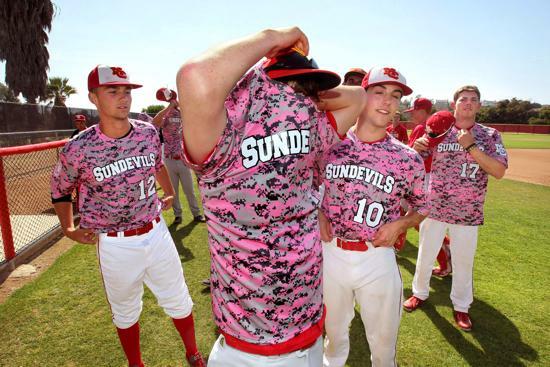 A number of Sundevils players and coaches have lost family members to breast cancer. For athletes, all games are important. For the Mt. Carmel High baseball team, Saturday’s game with Westview will be personal. The Sundevils will play their third annual Cancer Awareness Game in memory of those who have passed and for those who have survived. “It seems like everyone has been touched by cancer,” said Mt. Carmel baseball coach Chachi Mueller, who lost his mother Cathy to breast cancer in 1997 when he was 19 and she only 46. “Our team in particular has been hit hard by breast cancer. Proceeds are donated to cancer research. Family members of several Mt. Carmel players and coaches have been victims of breast cancer. Sophomore catcher Daniel Cope lost his mother Michelle in 2010. Pitching coach Kyle Owsley and his brother Carter Couch, the team’s DH, lost their mother Kendra in 2013. Junior center fielder Brody Prows lost his grandmother to the disease. A fundraiser game was the idea of Mt. Carmel assistant coach Keith Johnson, who had an aunt and mother-in-law affected by breast cancer. The first year, the game netted about $2,000. Last year’s event raised around $3,100. The goal this year is to do much better. “Really, the goal is to do away with the sad stories that surround breast cancer,” Johnson said. On Saturday, both teams will wear pink jerseys with the names of a loved one, friend or teacher who has been affected by breast cancer on the back. The jerseys will have a commemorative patch on the sleeve. “The first year we did this, we gave the boys two weeks to give us a name for the back of the jerseys,” Johnson said. “They all came back the next day with a name. The jerseys will be auctioned after the game in what is the day’s primary fundraiser. As the event has evolved, Mueller and his staff have added elements. Game Day Sports in Poway is asking $20 for a commemorative pink T-shirt, a car decal, a raffle ticket for a 2014 BBCOR baseball bat and $10 off merchandise in its store. Jalapeños Mexican Food on Carmel Mountain Road will have a full lunch spread. There is no charge, but the restaurant is hoping for donations to the fundraiser. There will be balloons and streamers in the stands. Mueller hopes to do the baselines and bases in pink. “This game is a big deal for me,” said Cope. “It’s definitely a different day because we’re playing for the team and for our moms. There is a big crowd, a great atmosphere. Being guys, are the pink jerseys tough to wear? Is anyone embarrassed by the color? “No one on this team has a problem wearing pink,” Prows said. “We try and keep this as a normal game, but parents, brothers, sisters, relatives, the students and teachers all show up. “So, yes, it means a little more. Mt. Carmel has a rich baseball tradition. Oakland A’s General Manager Billy Beane played for the Sundevils. Veteran major leaguer Eric Chavez of the Arizona Diamondbacks was a first-round draft pick out of Mt. Carmel.